I don’t know about you, but I never remember to soak my beans overnight! But to make a good chili, you just have to have some beans in it! I created this recipe so you don’t need to soak your beans AND you don’t have to slave over the stove for hours! Can we say win, win? 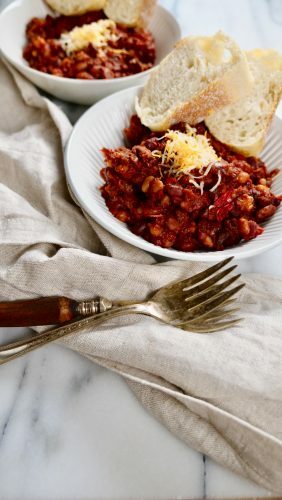 I am showing you the vegetarian version here, but if you like to add meat in it, it is the exact same recipe, but use the saute mode on your Instant pot at first and start off browning some ground beef until the beef gets a nice brown colour. Once the beef is turning brown, follow the steps below and add about 1 cup of water. You can adjust the heat to this dish by adding more or less spice and you can even add fresh peppers like ghost peppers if you really want some heat! This chili also freezes really well and makes for a perfect comfort meal as we brace for the upcoming winter months! Let’s hibernate together and eat chili, who’s with me? If you know me, you know I LOVE my instant pot and cannot live without it now. Check out my full review here! If you love instant pot recipes, have a look at my 8 minute butternut squash soup recipe, my salmon biryani, and this amazing beef stew instant post recipe! Comment below on your favourite instant pot recipe! 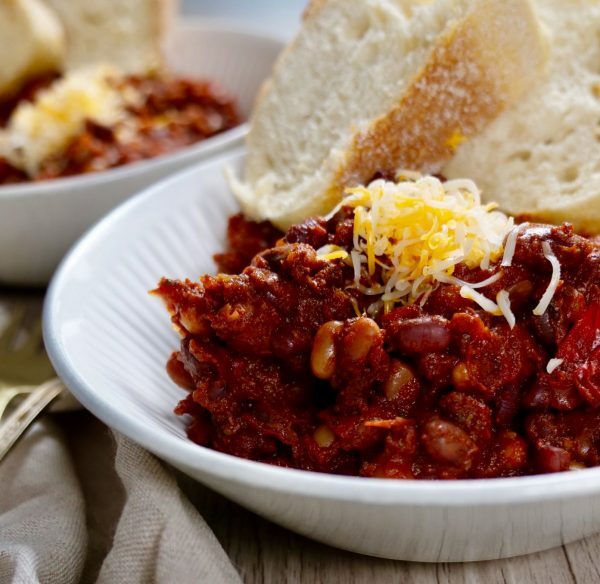 Serve chili with a pinch of cheese on top!